Save 1% on the Lovebay Three Head Led Grow Light Bulbs 15W Clip on Plant Grow lamp with Flexible 360 Degree Gooseneck and Three Separate Control Switches for Indoor Plants Hydroponics Greenhouse Organic Office Home by Lovebay at Aquaponics In Paradise. MPN: WAF-three-head-light-us. Hurry! Limited time offer. Offer valid only while supplies last. Lovebay Three Head Led Grow light - Like having a sun inside your home Provide better plant growth Gives off targeted wavelengths (460nm and 660nm). The LED lights have average lifespan of more than 30,000 hours. It uses far less energy and emits much less heat than fluorescent lamps. At Lovebay, we believe in our products. That's why we back them all with an 18-month warranty and provide friendly, easy-to-reach support. Please water you plants more than usual when you use the LED grow lights, but do not pour on the lamp, it is non waterproof. Do not leave on all day or use plant light more than 5 hours during the night. 24 hour use will harm your plants. Plants need time to rest. 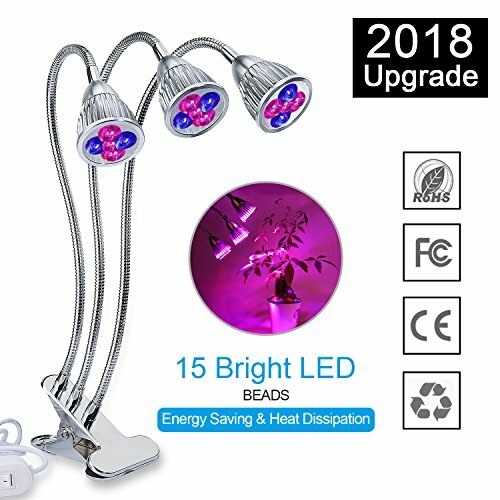 2018 Upgraded Three Head LED Grow Lamp: This plant growing light including 9 Red light (wavelength selection 620-630nm), 6 Blue lights (wavelength selection 460nm) gives off targeted wavelengths rapidly improves plant health and promote growth, generally more sprouts emerging up within 2 weeks of using our grow lamp on a daily basis. High Energy Saving-This led grow light is low power consuming, high luminous efficiency and long service life (more than 30,000 hours lifespan LED beads). With highly effecient heat dissipation aluminum shell, it does not generate any noticeable heat even after 17hrs use a, keeping temperatures at optimal level. Practical 360 Degree Design & Strong Clip Base: The lamps' flexible metal neck are made to be adjustable to virtually any position at any angle, plus 3 posable heads. This led grow lamp, can achieve 360°coverage of plants, the 15W ( 5W + 5W + 5W ) light source can cover a larger area . Three switches in total, each lamp head is controlled independently. With strong clip base and 24 inch long cord, you can stand or clip firmly to almost anything or anywhere you want. For Plants, Fruits & Veggies: Treat your greens to a full light spectrum and help them grow while extending the blooming period and increasing production . Perfect for indoor plants, succulent plants, flowering plants, foliage plants, potted plants, promoting leaves, flowers blooming and fruits.